We have spoken about her numerous times here on All Things Jabu and rightfully so. 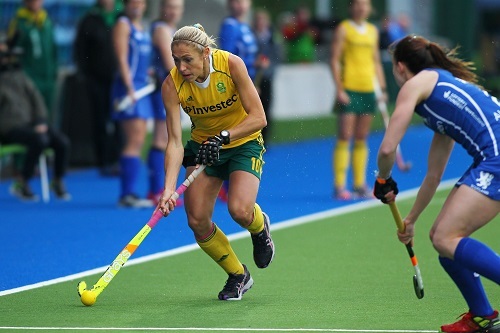 Shelley Russell is arguably one of the finest talents we have in South African Hockey. Shelley comes from a fantastic sporting family and is the second Russell we have interviewed on the blog (We interviewed Brent a while back too). 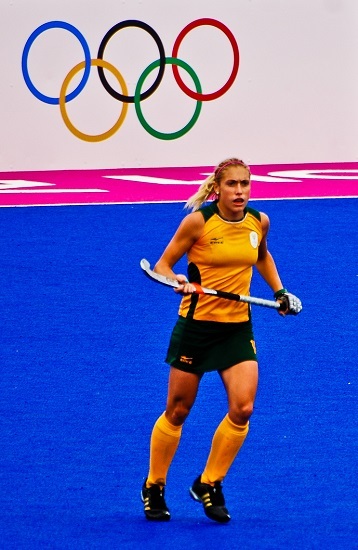 Shelley has now played in the FIH World Cup, the Olympic Games and the Commonwealth games and with each tournament she lifts her name even higher on everyone’s list of favourite hockey players. With an incredible speed to lead the break and close control that would make most hockey players jealous, it is the tackling ability that stands out from the 206-capped superstar. We chatted to Shelley about all things Hockey. Jabu: First and foremost, we have actually interviewed your brother in the past, what did the Russell parents feed you guys? Shelley: Ha ha! That sounds like a question that was asked of my brother, Brent, and Craig Davidson after a test match against Wales at Newlands in 2002. He and Craig were roommates for the test, and were the only 2 try-scorers in the match. If anything, I would have to say that my brothers and I were fed on a diet of a love for sport, as part of our family lifestyle. In the early days, we would be plonked on the side of a cricket or rugby field, or hockey pitch or tennis courts, watching our parents enjoying their sport. I also spent too many hours waiting for my Dad to come past during his Comrades runs. Those were long days for me, let alone for him! The roles soon reversed, however, and they spent many an hour supporting us in our sporting activities. 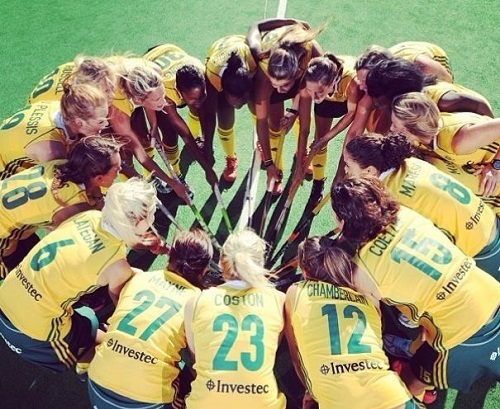 Jabu: You have recently passed 200 caps for the SA Hockey Ladies, any specific cap that sticks out in your memory? Shelley: Naturally, one’s debut game is always memorable. I can remember the event clearly, back in 2006, coming off the bench at Stellenbosch against the touring Indian side and being announced over the speaker system, in front of so many of my university friends and acquaintances, who were quite vociferous in their support. I say “memorable,” but I can remember very little of my actual time on the pitch. I suppose that I was concentrating so hard on not messing up too badly! The big tournaments were also very special; I have been to 3 Hockey World Cups and both the Beijing and London Olympics, but if one particular game sticks out in my memory, that would be the final of the Olympic qualifying tournament against India in Delhi. It was a “winner takes all” type of game. I managed to get onto the scoresheet early on, which helped to set up a good win. We were so excited with our win, that we celebrated almost all the way back home to SA. Jabu: Although hockey is not in the same media stream as the big 3 in South Africa, do you ever get recognised in public by any fans and how does this make you feel? Quite a few people have come up to me, and told me that they do their gym training under my watchful eye – there is a largish wall mural of me in quite a few of the gyms around town. Jabu: As a player who is sponsored by Grays Hockey, which Grays stick do you use and why? Shelley: I have been playing with a GX9000 and player pro sticks over the last few months but I am in the process of making my own Grays stick. It is a player’s series stick that will be bright pink with teal patterns on it. I have always wanted a bright pink stick and finally I will get one! Yay! The stick will be out in the shops end of the year for all to buy so look out for the SR10 stick! Jabu: We will make sure we do a giveaway here on All Things Jabu. What can we do in South Africa to bridge the gap between our hockey and that of the top nations? Shelley: First and foremost, our hockey has to become a professional sport. This will allow the girls coming through the system to be rewarded for the considerable time spent being dedicated to the sport, and they can pursue hockey as a career, and importantly afford to stay playing for longer. At all the major hockey tournaments that we attend, we are the only teams (SA Men and Women) whose players do not earn a salary for playing. In a way, you could say that we are the World’s top amateur teams. Having said that, I firmly believe that the gap is closing, and the margins between us and the top teams is narrowing considerably. Unfortunately, after big tournaments, such as the Olympics, World Cups or Commonwealth Games, there is inevitably a drain of top players retiring from the game, because of the career problems mentioned above, and we have to start the re-building process all over again. At the moment, we don’t have a coach – Giles Bonnet having finished his stint as our National Coach, and his replacement not having been announced as yet. So, there is a lot of uncertainty in the squad, and we haven’t been training together for months, while the majority of our opposition countries have been pressing on regardless. 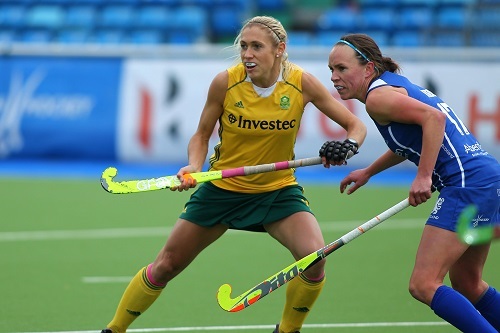 Our SA Women’s Hockey sponsor, (backer) Investec, have identified a problem of a lack of an academy structure, whereby good talent is identified, and developed in a series of intensive training programmes. Being the good partners that they are, they are backing this ideal, and have put up some considerable resources to get this off the ground. We should see the first training camps coming through in early 2015. Jabu: This is an absolutely epic story to hear and I am sure this will help us close the gap as well. How do you feel about Giles leaving the team? Shelley: Giles has been such a huge part of getting us to the point where we believe that we can compete with the “big dogs” in World Hockey. Our results have not always borne this out, but the “gap” has definitely narrowed, and he has definitely brought a degree of “professionalism” into our effectively amateur team. Getting most of the squad overseas to play in the European (Belgian, Dutch and English) leagues has raised the bar somewhat, and provided good exposure for the girls. Since he has left, there has been a bit of a vacuum, with no replacement coach being announced as yet, and I feel that we have lost a lot of ground through this, with no continuity of training squads or programmes being run. I hope that this doesn’t cost us too much! Jabu: Having played in Beijing and London, will you be looking to add the hat-trick by competing in Rio? Shelley: I would love to go to another Olympic Games, and will be going all out to prepare myself for that eventuality. For amateur sportsmen, taking part in such events is very often the principal reason for slogging away for season after season, in a way the reward for personal sacrifices. There are always hurdles to cross, however, such as the issue of qualifying for the tournament, and further qualifying criteria imposed by sporting bodies such as SASCOC. Jabu: And how does the Olympics compare to the recently completed Hockey World Cup? Shelley: I think that the Olympics stand alone as the ultimate sporting event to take part in. It is the coming together of the finest sportsmen and women in the world, across all the Olympic participation sports. Staying together in the Olympic Village is quite special – you get to rub shoulders at canteen food counter with huge names in sport, such as Usain Bolt, Roger Federer, etc. Jabu: What other sports did you play while you were at school? Shelley: I took part in anything that was going, from swimming, netball, (in Prep School) tennis, athletics, cross-country, squash, and of course, there was always hockey. I somehow managed to win the school tennis championship in my Matric year. Jabu: That is so impressive and makes me doubt my own abilities. You have managed to travel to a few different countries, have you got a favourite destination? Shelley: I just love touring, and seeing new countries, new places, and meeting people of different cultures. I think I drive my teammates mad, as I usually pick up a few local phrases, and mimic the local accent. Even when not on tours, I like to travel to new destinations, and after the Hockey World Cup in The Hague, I got in a trip to Northern Italy, which was awesome. My experience of visiting Cinque Terre for the first time blew me away – it is just so quaint and unique. I first saw the town on Stresa on Lake Maggiore when passing through the Alps on a train a few years ago, and just knew that I had to get back there. I was fortunate enough to tick that one off my bucket list, and also enjoyed touring around Lake Como. Such beautiful scenery – like Hartebeespoortdam on steroids, with the snow-capped Alps surrounding it, instead of the Magaliesberge! Jabu: You are not generally known as a goal-scorer, but of the goals you have scored, which one stands out for you? Shelley: Too true, my role in the team usually being to set up the strikers, and to attack into the circle to win penalty corners. I have, however, scored a few over the years, and I was even the top goal-scorer at one of the African Games tournaments some years ago!! Earlier this year I got onto the end of a crossed ball against England in the Investec Series in London, and slid the ball past Maddie Hinch, the England keeper, who was also my club teammate at Holcombe in Kent. Probably my most important goal, was the goal early on in the final of the Olympic qualifying tournament in Delhi, against the Indian side. Getting an early goal galvanised our team, and we managed to get on top, and control the game thereafter. Winning that match, and the ultimate prize of competing at the London Olympics, made it an important and special goal. Jabu: And who is the team joker? Shelley: Oh, we have had a few over the years, and all of the girls have their moments of humour. I would have to say Marcelle Manson (Keet) can always be relied on for something zany. When I was appointed as the team’s entertainment manager, the first person I seconded onto the committee was Marcelle. Our role is to create some excitement and entertainment off the field, to assist with the team-building aspect. I think we do alright! Jabu: What about youngsters, is there anyone pushing into the team that you think will have an epic career? Shelley: There are many talented youngsters coming through. Our Goalkeeper at the Commonwealth games is only 19 years old and now has quite a bit of International experience at big tournaments. I think she will only get better and has a long career ahead of her! Jabu: Away from hockey, who else do you support? Shelley: I always support any of our National teams whenever they are involved in Internationals. I support the Sharks, and think that the vibe at Growthpoint Kings Park is quite unique. Growing up, my brothers were avid Liverpool FC supporters, so I take an interest in what they are doing. Jabu: And lastly where can our readers interact with you? Jabu: Thanks for your time. What a legend! Give Shelley some love and help support our SA Women as they continue to defy the odds. Nike Unveil the new Bafana Kit! I THINK SHELLEY RUSSELL IS A PROFFESIONAL HOCKEY PLAYER.GO SHELLEY U ROCK!!!!!!! !